Bruce Dickinson, vocalist of rock gods Iron Maiden, pours himself a pint of Trooper. If you are a metal aficionado, Iron Maiden is probably a band that’s always on rotation. If you are a beer connoisseur, then we figure craft beers are always rolling through your wheelhouse. If you work at CBB, the two are usually combined. But now we all might actually get the opportunity to drink official Iron Maiden craft beer while listening to classic albums like Powerslave. Real ale fan and history aficionado Bruce Dickinson is the vocalist of rock gods Iron Maiden, and he’s played a major role in developing the unique flavor of Iron Maiden’s new craft beer called Trooper, which entailed ongoing visits with collaborator Robinsons Brewery in Stockport, England. Maiden’s on-stage Union Jack flag-waving military character Eddie is of course “The Trooper.” Not to mention that’s an awesome Iron Maiden song written by bassist Steve Harris. The single cover art is even the same as the beer label. Maiden are one of Britain’s most influential and revered bands (and a CBB favorite), with close to 90 million album sales, more than 2,000 live performances in 58 countries and 15 studio albums, including the most recent (The Final Frontier), which is their biggest ever chart success attaining No.1 positions in over 28 countries. Robinsons has been brewing award-winning beers from its Unicorn Brewery in Stockport for 175 years. Best known for its legendary Old Tom strong ale, which was voted “World’s Best Beer” by the international Beers of the World publication, it’s actually Robinsons’ younger ales (Dizzy Blonde and ‘build a rocket boys!’ beer, produced in partnership with Manchester band Elbow) that have lately been causing a stir in the beer world and introducing future ale drinking generations to Robinsons. “Trooper is a premium British ale with true depth of character and flavor,” explained Robinson. “For more than 30 years, the unmistakable icon of Eddie, the band’s instantly-recognizable mascot, has adorned every album cover, T-shirt and poster, so it is fitting that Eddie will now adorn the cask pump clip and take center stage on the bottle label of Trooper. 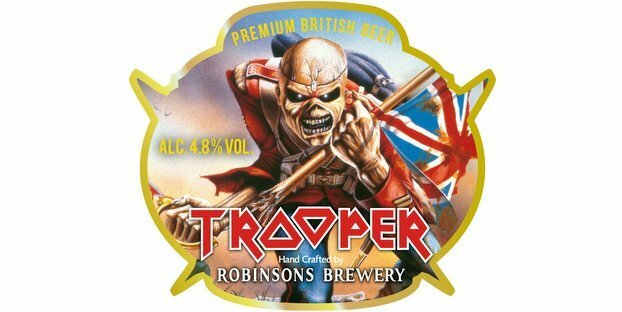 Fans of both Iron Maiden and real ale can sign up to get news and updates on Trooper Premium British Beer from ironmaidenbeer.com, where bottles will be available to purchase by both UK and overseas customers from May 2013. Devil’s Horns!! !